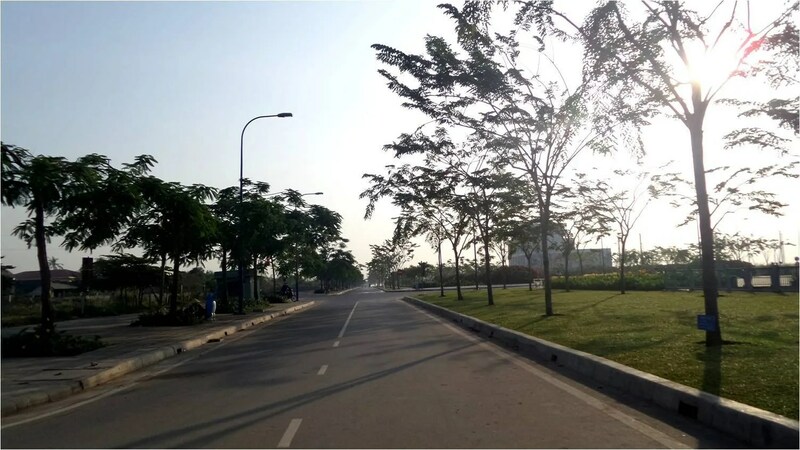 Tales from the Trails: Phu My Hung – Cau Thu Thiem – Cau Phu My | Hello Saigon! It’s been a while since we biked for over 25 kilometers. 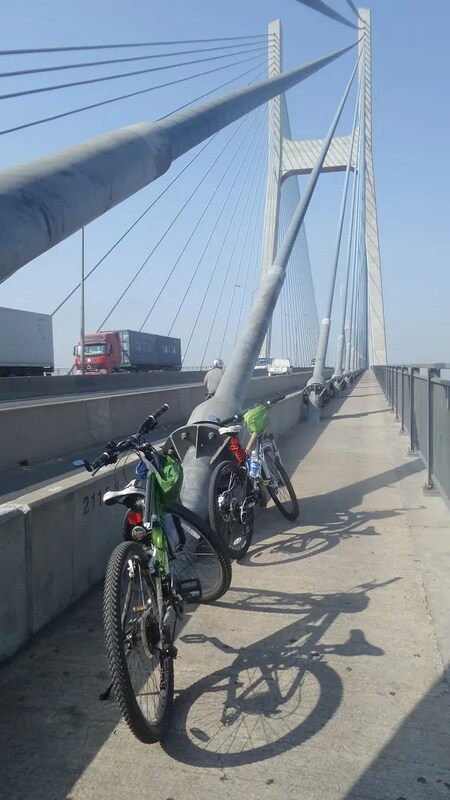 When you’re used to a relatively flat terrain in the city, the bridges are huge hurdles — longer, steeper, and with racing motorbikes. Friends though were hell bent on bringing us to Thu Thiem bridge. What’s so special about getting on the other side? Well, we just had to find out. And if you bring me and my friend around, we were sure to turn the bike ride into a photo opportunity as well. It took time to finish the route with frequent stops to take photos. Good thing that the cool weather hasn’t left us yet, so it was not stressful to bike ’round the city. We started at past 6 am and got back to Phu My Hung at past 9 am. 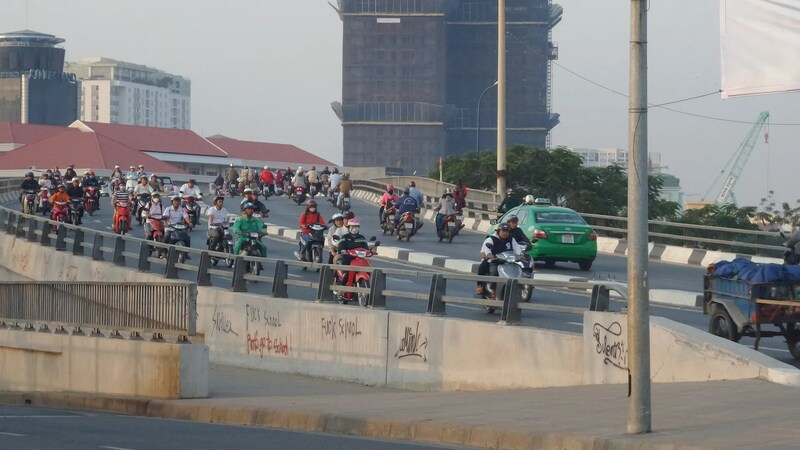 Not sure if it was the same spot where Adam Robert Young took one of his Saigon Panorama photos, but it was sweet to take a shot of the bustling Saigon city from our vantage point above Thu Thiem Tunnel. Obviously this area has an unencumbered view of the city and is a terrific spot to watch ships and barges go by. Am actually surprised that there were no soon-to-be-wed couples milling about having their photos taken. This spot is picture perfect. The bridge is 705 meters across the river BUT if you traverse the bridge, it’s something else. Let’s say it’s around 500 meters to get to the peak. I biked halfway through and walked the rest of the way up. Needless to say, I was already in my first gear. 😛 It was late into the morning but we saw a couple of bikers as well who of course had no trouble going up the bridge. Then on the way down, I was a bit worried because both my breaks are worn. I could smell burning rubber as we speedily sailed down. My bike definitely needs some r&r soon. I cannot yet say I conquered Cau Phu My but it was a valiant effort on my part. 😀 And 31 kms ain’t bad. One thing I learned from this trip is that despite the fact that I hate biking together with a throng of motorbikes, they sure do make biking a lot less tiresome. When we were biking along areas where there were kilometers of nothing, my mind would drift to how tired my legs were, how far we still have to go, and every other ache in my body. With other bipeds around, my mind would be focused on not getting knocked off my lane. Haha. Since we tackled Cau Phu My from District 2, there definitely is a next trip coming from District 7 which is the more challenging approach. On to the next bike ride! 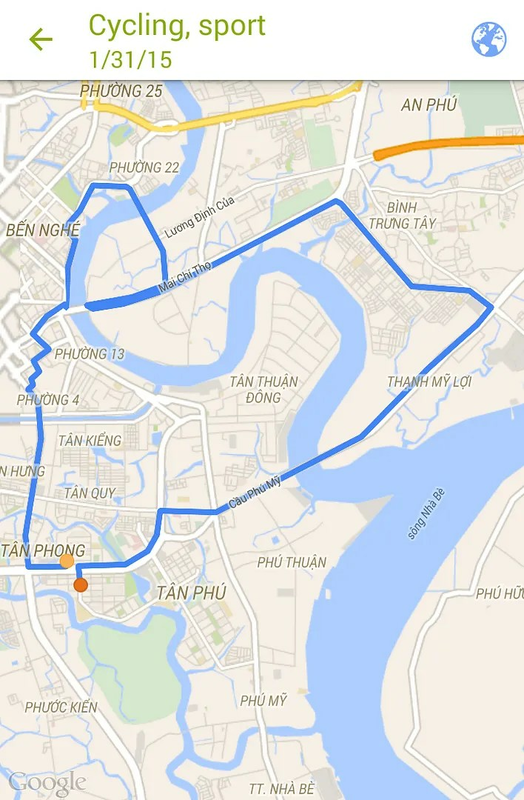 This entry was posted in Exploring Saigon and tagged bike, Cau Phu My, Cau Thu Thiem, Phu My Hung. Bookmark the permalink. 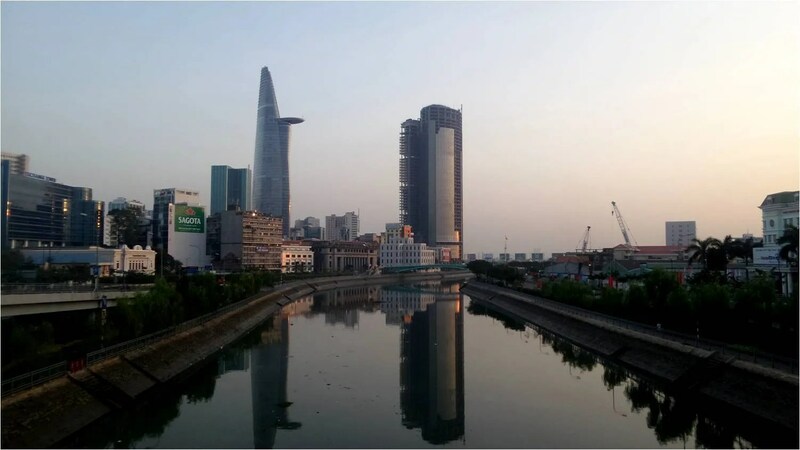 Pingback: The End of Tet 2015 | Hello Saigon! It’s almost one of the spots I took one of the photos for Saigon Panorama. Mine was just the other side of the bridge to the right in the photo, and I’d climbed halfway up one of the huge billboard things there. 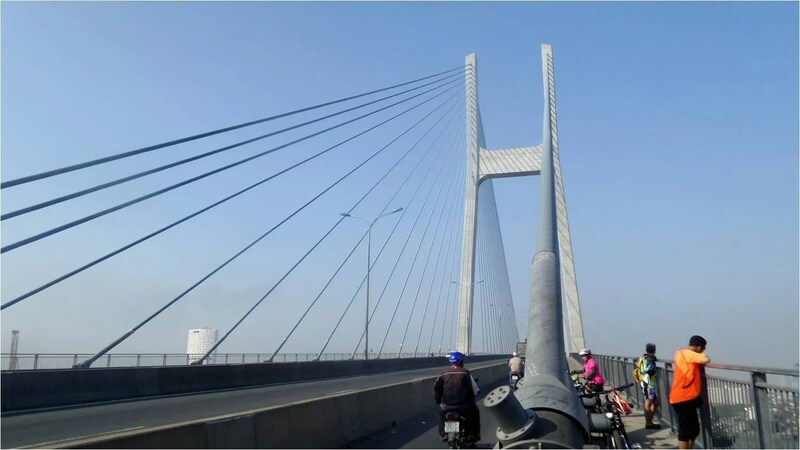 I always liked riding over Phu My Bridge, but only with a motor! Ambitious doing it by pedal power (or at least trying to)! Hope things are going well for you there, I often miss Saigon.